Danforth’s Building Information Modeling Team works hand-in-hand with our Engineering, Estimating, Construction and Maintenance Teams to facilitate planning and implementation of our projects. We utilize this technology to improve internal and external collaboration during the design, construction, and operation of our customer’s facility. Building Information Modeling (BIM) is a process utilizing information sharing and 3D modeling to discover design conflicts in the office and develop working solutions prior to field construction. Danforth offers our clients a single source for crucial project information. This improves the organization and execution of even the most complex jobs. BIM is especially useful to Danforth as it relates to our prefabrication capabilities. Our in-house BIM operators can coordinate with our pipe fabrication and sheet metal fabrication shops and those shops coordinate with field personnel to preempt field installation conflicts and reduce field labor hours lost due to these conflicts. Our BIM Team employs the computer technologies available, to collaborate with the Design-Build Team, construct informational 3D building models, and streamline our workflow. 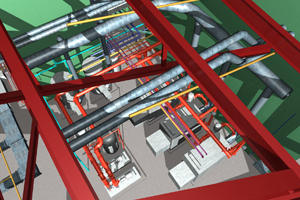 As a self-performing mechanical contractor, BIM is critical to maximizing our efficiency on project delivery. Start Your Building Information Modeling (BIM) Project with Danforth. Meet with one of our Building Information Modeling (BIM) consultants. We’ll outline our process and begin your project estimate. Need More information? Send us a quick message and we’ll reach out to you to help plan your next BIM Services project. Get answers about our Building Information Modeling (BIM) services and speak with a knowledgeable Building Information Modeling Expert.